One of the most geologically complex and diverse states, California spent much of the age of dinosaurs under water. While most of the fossils found in the state are those of reptiles that lived in the sea (thalattosaurs, ichthyosaurs, mosasaurs, plesiosaurs, and turtles), some are those of birds and pterosaurs that soared above it. Other fossils come from terrestrial animals that died and were washed into the ocean. These include turtles, crocodiles, lizards, and dinosaurs such as armored ankylosaurs, duck-billed hadrosaurs, and a variety of carnivorous dinosaurs. 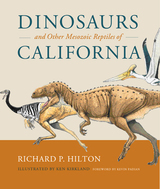 Richard Hilton is the first to tell the unsung story of the dinosaurs and reptiles of land, sea, and sky that lived in California and Baja California during the Mesozoic era (245 million-65 million years ago), in addition to the history of their discovery. Vibrantly illustrated with more than three hundred photographs, paintings, and drawings, this book provides geological and environmental details, describes the significance of the major fossils, and chronicles the adventures involved in the discovery, preparation, and publishing of the finds. Hilton also includes accounts of the scientists, teachers, students, ranchers, and weekend fossil hunters who endured (and continue to endure) harsh weather, fires, wild animals, and the usual challenges of fieldwork to collect fossil remains and make major discoveries. These enthusiasts managed to safeguard an abundance of fossil resources, some of which would otherwise have been destroyed by quarrying, paving, and housing developments. Dinosaurs and Other Mesozoic Reptiles of California takes this legacy one step further by documenting information about the fossils and their finders in accessible prose and vivid artistic renderings, creating a valuable contribution to our understanding of California’s prehistoric past. Richard P. Hilton is Professor of Geology at Sierra College in Rocklin, California. Appendix B. Summary of the Mesozoic Reptilian Fossils of California.